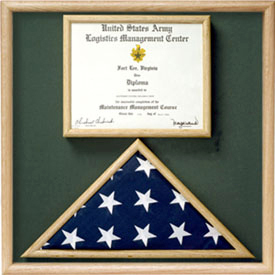 These solid oak or walnut cases are designed to beautifully display both a folded flag and other memorabilia in one place. These solid oak or walnut cases are designed to beautifully display both a folded flag and other memorabilia in one place. We offer five different styles to suit most needs. Three of these styles are available in : For a 3' x 5' Flag. All have our normal choice of background fabric. Complete care instructions are provided.